Following on from fuzzy finding in Bash with fzf, this post will discuss usage of the fzf tool within the Vim and Neovim editors. Please do read fuzzy finding in Bash with fzf to first gain insight about the fzf tool. That post notes how to install, configure and then use fzf within the Bash shell. Fuzzy finding is a powerful search technique that can be just as useful inside an editor as it is at the command-line. Useful fuzzy finding operations within an editor, such as Vim, may include: opening a project file in a far-away location by short fuzzy name, switching to an open buffer by fuzzy name or opening a file by fuzzy tag. As always, feel free to refer to my bashrc and vimrc files to view my fzf configurations. For the best user experience, please use a modern version of Vim or Neovim that provides a built-in terminal. For Vim that means using version 8.1 or later, and for Neovim that means using version 0.2 or later. GUI-based Vims, such as gVim and MacVim, especially benefit since versions pre-terminal integration, when running fzf, would spawn an ugly external terminal window which was highly unpleasant. I recommend installing and updating Vim, or Neovim, using Homebrew on macOS and Linuxbrew on Linux. The fzf tool provides basic Vim integration out of the box. However, I strongly recommend installing and using the fzf.vim plugin which smartly wraps the fzf command-line tool whilst also providing a number of powerful Vim commands. Note, both fzf and fzf.vim were created and are maintained by Junegunn Choi, hence, they will always be synchronized if installed and updated simultaneously. Just like the command-line tool, fzf.vim provides responsive real-time updates as fuzzy text is entered. Then run :PlugInstall to install both the fzf command-line tool and associated Vim plugin. You may wonder, if one has already installed the fzf command-line tool why bother with installing it again via a Vim plugin? Basically to maintain runtime synchronization between the Vim plugin and command-line tool. If using a different plugin manager please adjust the above statements appropriately. With fzf.vim installed we can now focus on how to use fzf within Vim. Hint, use the ESC key to quickly dismiss an fzf window. The :Files command is a fuzzy file finder. Without an argument :Files will recursively search files that match the supplied fuzzy query from the current directory downwards. Note, when the fzf command line tool is configured to use the fd tool, Git ignores will be respected, which can greatly increase fuzzy find performance. Please refer to fuzzy finding in Bash with fzf for details about how to configure fzf to use fd. Refine a search by entering in more characters at the prompt. Use the UP and DOWN keys to move the selection line. Hit the ENTER key to edit a selected file in the current window, or use TAB to first select multiple files and then hit ENTER to edit all the selected files. To open the selected file(s) in a new tab, rather than the current window, use Control-t instead of ENTER. Similarly use Control-x or Control-v to open file selections in new horizontal or vertical splits. Typing :Files soon becomes a burden, instead please use a mapping like the following. let mapleader = " "
Hitting SPACE SPACE quickly brings up the fuzzy file finder. An alternative would be to map Control-p to :Files if transitioning over from the CtrlP plugin. Sometimes one may need to edit a sibling file of the currently edited file, that being a file in the same directory with that current file. This SPACE DASH mapping will open the fuzzy finder just for the directory containing the currently edited file. DASH was chosen due to previous experience with Tim Pope’s Vinegar plugin. Modern project frameworks, such as Ruby on Rails and Create React App, are opinionated with regards to directory structure and project layout. Those opinionated project layouts, as created by the above listed frameworks and others, can form the basis for fuzzy project navigation. In a Rails application, controller files are located in app/controllers, whilst models are located in app/models and lastly views are located in app/views. With that in mind the following mappings will provide quick fuzzy access to controller, model and view files. A React application on the other hand may be navigated with the following mappings. When dealing with multiple frameworks I recommend scoping such key mappings by searching for a distinguishing file, that way key mappings can be reused such as the <leader>ec mapping noted above.
" This looks like a Rails app, add Rails specific mappings here.
" This looks like a React app, add React specific mappings here. Note, the vim-rails and vim-projectionist plugins can also be used be used to navigate projects. All these project navigation techniques are complimentary, they can happily co-exist. The :Buffers command is used to quickly switch to an open buffer. The :Tags and :BTags commands are used to navigate a project by fuzzy tag. The :BTags command will limit navigation to the tags associated with the current buffer whilst :Tags will use the complete project tags. The :Commits and :BCommits commands are used to explore a project’s Git history. The :BCommits command will limit exploration to the history associated with the current buffer whilst the :Commits command will explore the complete history of the project. Note, these commands depend on Tim Pope’s fugitive plugin. If not already installed, please add the following to your ~/.vimrc file, then run :PlugInstall if using vim-plug, otherwise adjust appropriately if using another plugin manager. The g:fzf_commits_log_options option customizes the appearance of Git log command used by the :Commits and :BCommits commands. ripgrep is an excellent command-line text search utility that I have previously posted about. 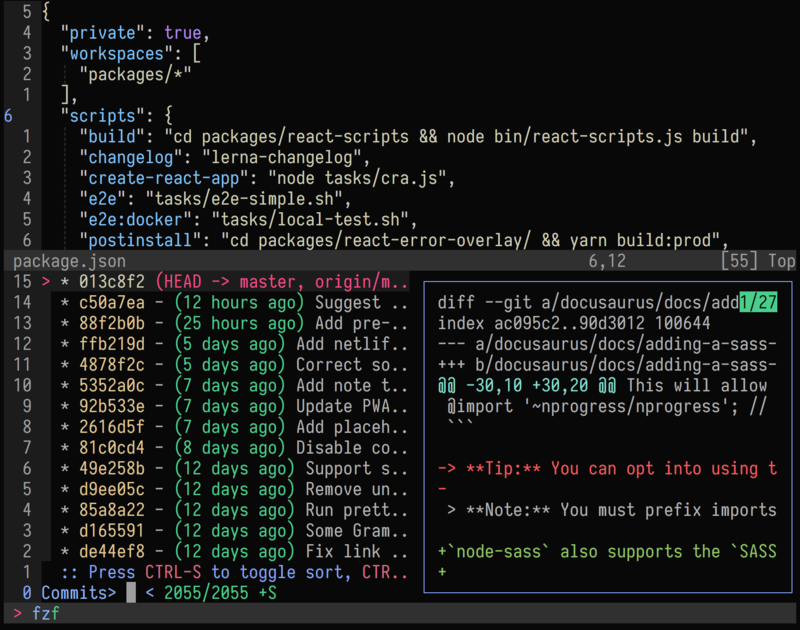 The fzf.vim plugin provides access to ripgrep with the :Rg and :Rg! commands. Both commands should be launched with a search term, for example :Rg my_search_term. The bang version, :Rg!, launches a fullscreen window whilst :Rg launches the usual bottom-of-screen split window. Once a search has been completed, fzf can be used to filter the results to just those of interest. If only one selection is chosen then that match will be opened, otherwise if multiple selections are chosen then the first match will be opened along with the quickfix window listing all matches. Note, use Alt-a and Alt-d to select and deselect all matches. The preview window can be toggled with the QUESTION MARK key. Sometimes one may want to open an out-of-project file that had been previously edited in Vim. Such a need is best served by an MRU (most-recently-used) cache that can provide access to a list of recently opened files. The fzf.vim plugin unfortunately does not provide any MRU functionality, however, the fzf-mru plugin does provide a bridge between fzf and a MRU cache. Run :PlugInstall to install the plugin. If using a different plugin manager please adjust the above statement appropriately. The SPACE m key combination will launch the fzf window with a list of recently opened-by-Vim files. The fzf.vim plugin also provides the following useful commands. 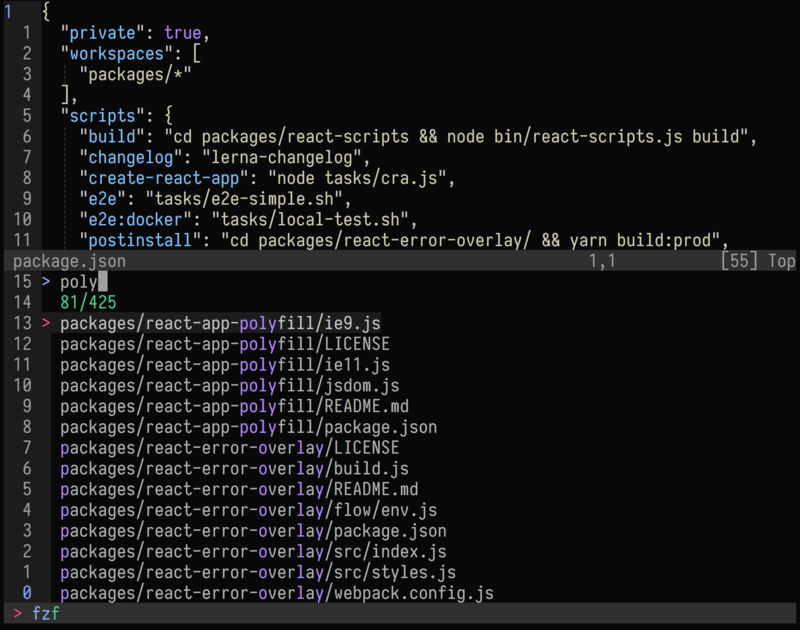 The CtrlP plugin is the precursor to most Vim fuzzy finding plugins. It is an excellent plugin which is still actively maintained. I used CtrlP for many years. I even posted how to turbocharge the CtrlP Vim plugin. So why am I not using CtrlP anymore? Answer, performance. Even with the turbocharging noted above CtrlP can still slowdown when navigating huge source trees or when navigating a very large tags file. Neovim especially, when running the cpsm CtrlP matcher, can be sluggish due to the cost of Python RPCs (remote-procedure-calls) as noted in this issue. The fzf.vim plugin is highly performant, even when dealing with very large source trees or tags files. Pattern matching is asynchronous and progressive, so it usually feels very fast and rarely laggy. I will note, if you are a CtrlP user, and its performance is fine to you, then there really is no need to change over to fzf.vim unless some of its unique features, such as :Commits or :Rg, appeal to you. I have found fzf-based fuzzy finding, when editing in Vim, to be a productivity game-changer.